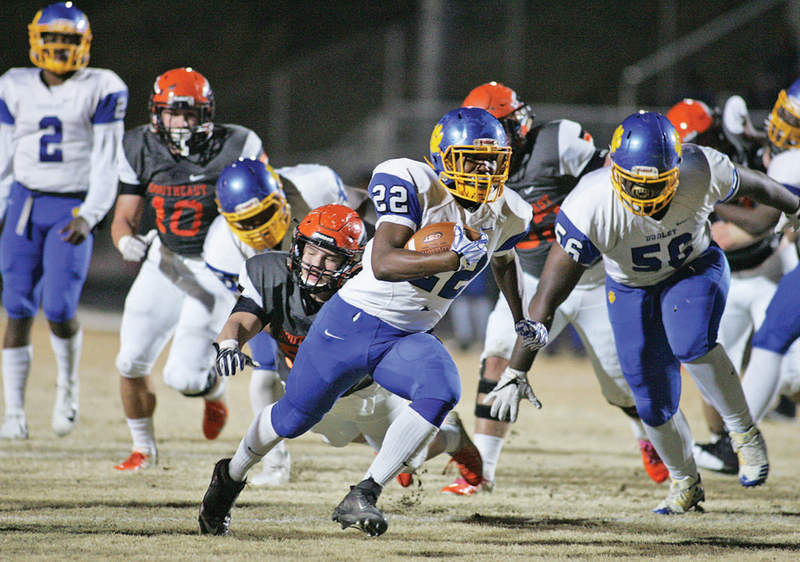 The Falcons of Southeast Guilford trailed 12-0 at the half but rallied for a 21-18 win over the Dudley Panthers in the NCHSAA 3-AA East quarterfinals. Second-seeded Southeast (13-1) advances to play No. 4 Cleveland (12-2) this Friday in Shelby, N.C. at Bill Slayton Stadium. This game will determine who will play in the 3-AA East State Championship game December 15 in Chapel Hill. The Panthers capitalized on two Falcons’ fumbles to score touchdowns by sophomore Milan Summers on an 18-yard run and on quarterback Tawahn Young’s four-yard dive in the second quarter. The Falcons opened the third quarter with a long drive with quarterback Ryan Douglas scoring on a short run. The PAT was good. Douglas led the Falcons’ come back with 18 carries for 69 while passing for 13-of-23 for 181 yards and another score. The Falcons took the lead for good with less than nine minutes remaining in the game with the score at 21-12.